For this edition of Cooking with the Shoe Doctor, I'm making my first cheesecake ever. I went raspberry picking several weeks ago and I made some raspberry jam, so I was inspired to make something with raspberries! 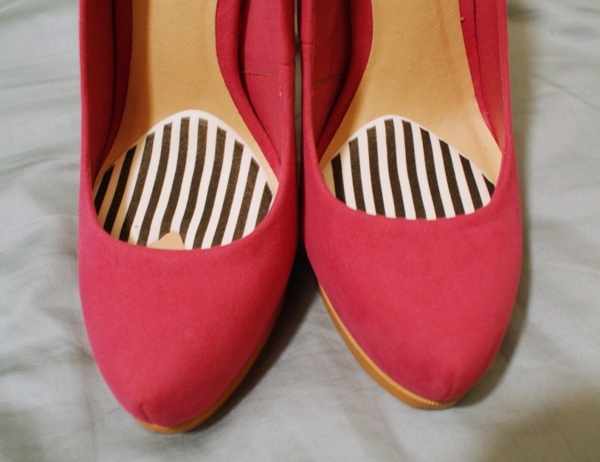 Plus, I have these lovely raspberry-esque shade pumps to break in. This is Ashley from Sole Society. She has a 0.5" platform with a 5.25" heel! By far the steepest heel in my collection. So steep, in fact, that my feet slip forward. So I added my favorite ball-of-foot cushion to add extra grip to prevent slipping forward. The quality of Ashley is superb! The faux suede upper feels like velvet and the style is lovely, which is why I decided to keep her. She's definitely not "I'm going to walk" heels, more of "I'm going to sit and look pretty" heels. When I first put her on, the toe box was rather tight, so of course I broke her in while cooking! Or in this case, baking! Preheat oven to 325 degrees F. Soften cream cheese in microwave, about 45 seconds on high or until easily stir-able and at room temperature. Blend with sugar until smooth. Beat in flour, vanilla extract, and sour cream. Add eggs and beat until just combined. Consistency will be like that of cake batter. Fold in white chocolate chips and pour into graham cracker crust. Microwave the raspberry jam until smooth (don't overheat). 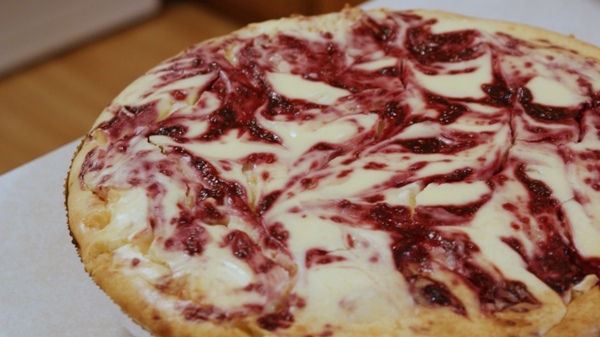 Drop spoonfuls of jam into pie and use a knife to cut through batter to create lovely swirly patterns. Bake at 325 degrees F for 80-85 minutes or until the center is set (use a toothpick to check, if the pick comes out clean, it's done). This recipe is for a 12-serving pie. If you are making a 8-serving pie, multiply the filling recipe by 2/3. I used a mix of non-fat cream cheese and 1/3 reduce fat cream cheese and the results were excellent! By the time I put the cheesecake in the oven, the toe box of my Ashleys were feeling much more comfortable. I hope you enjoyed baking with me!